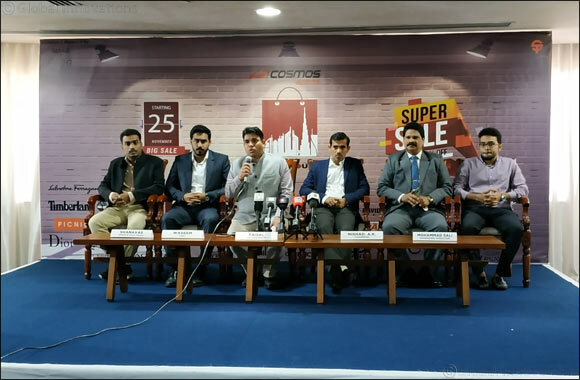 Dubai, UAE, November 22, 2018: It's time to bring global brands to consumers at a reasonable price, Organizers informed in a news conference in Dubai that they will be organizing 'Cosmos Warehouse Sale' in Karama. The fair starting on this coming Sunday (25.11.2018) will last till 25th December . Cosmos sports, one of the prominent multi-brand sports and ﬁtness showrooms in India is organizing Cosmos Warehouse Sale. The sale will be held on the back of the Cosmos Sports Showroom opposite to the general post ofﬁce in Dubai Karama. The marketing fair is open from10 am to 11 pm. Apart from the Cosmos Warehouse sale Cosmos sports is inaugurating their second outlet at Madina Mall, Al Qusais by Asian track cup bronze medalist Mr. Mohammed Al Murawwi on 23rd November 2pm. Later the showroom will be visited by stars of Malayalam Movie Kayamkulam Kochunni, Nivin Pauly, Roshan Andrews, Sunny Wayne, Priyanka Thimnesh will join the function. Cosmos sports in advance to make the people better acquainted with the best ﬁtness equipment by expressing solidarity to the goal of the Dubai Fitness Challenge in the second phase of Dubai Crown Prince Sheikh Hamdan bin Mohammed bin Rashid Al Maktoum aimed at exercising among the people and improving health care. Cosmos Sports Co-chairman AK Faisal said: 'This is a vast array of sports that has special interest in sports. Along with that, other international brands are also coming up to promote a great shopping experience,' he added.